Despite not getting much offseason publicity or hype, the Colorado Rockies demanded the attention of baseball observers with a 10-0 statement win over the Milwaukee Brewers on Opening Day. It was just the third time in Rockies’ history that the ball club scored at least 10 runs on Opening Day. According to Elias Sports Bureau, it was MLB’s largest shutout victory in a season-opener since 1988 and just the second time ever that an NL team recorded an Opening-Day shutout with 10 or more runs. The last time an NL team did so was over a century a go when the Pittsburgh Pirates beat the Cincinnati Reds 14-0 in 1911. The Rockies also became the 32nd team in MLB history to produce at least eight extra base hits on Opening Day – and they accomplished the feat by the end of the fourth inning. Meanwhile, the Rockies shutout their Opening-Day opponent for just the second time in club history. 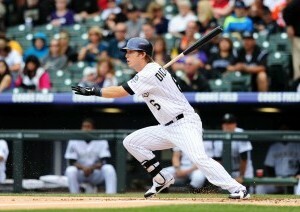 Colorado was led by offensive outbursts by Troy Tulowitzki, Carlos Gonzalez, Nolan Arenado, and Corey Dickerson. Arenado and Dickerson each delivered a homerun, a double, and four RBIs. Dickerson’s two-run double in the fourth inning would have easily been a triple had the ball not bounced over the center field wall for a ground rule double. The Rockies’ offense wasted no time, exploding onto the 2015 scene with a four-run first inning. Tulowitzki, Gonzalez, and Arenado doubled before Dickerson sent a two-run bomb over the fence to establish an early 4-0 lead. The 25-year-old became just the fourth player in club history to hit a homerun in the first inning of the season. Tulowitzki got the scoring started with an RBI double in the first inning. He posted two doubles and one RBI on three hits in the game. Colorado tagged Brewers’ Opening-Day starter Kyle Lohse with 10 hits and eight runs in just three and one-third innings. By the end of the fourth inning, the Brewers were already in an insurmountable 10-run hole. Gonzalez chased Lohse from the game with an RBI single to right field in the fourth inning. He went 2-for-4 before getting some rest toward the end of the ball game. Gonzalez was robbed of another double and two more RBIs by a great defensive play by Brewers’ first baseman Adam Lind in the second inning. Rockies’ Opening-Day starter Kyle Kendrick even got in on the offensive action. The athletic pitcher popped a double off the top of the left field wall that nearly went for a homerun. The 30-year-old went 2-for-3 and scored a run in the game. Kendrick was equally spectacular on the mound. The righty tossed seven scoreless innings, striking out six and allowing seven hits. He became just the third Rockies’ Opening Day starter to not allow a run. Last year’s batting champ, Justin Morneau, was surprisingly the only player in Colorado’s starting lineup to not register a hit in the convincing victory. 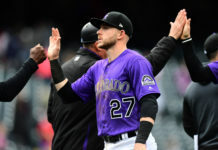 While the Rockies produced offense in abundance, much of the rest of the league struggled – six teams were shutout on Opening Day. Now, let’s not forget that this was just one game of a tumultuous 162-game schedule. This team still has to prove they can keep their star players in the lineup to have any chance in the competitive NL West. Nathan is a staff writer for Mile High Sports. He can be reached on Twitter at @TheRealNatron. For complete coverage of the Avalanche.